When Suits kicks off its eighth season in July, the show is going to look and feel pretty different. If you haven’t seen the season 7 finale of Suits and want to avoid spoilers, we suggest you stop reading now. If you’d like to hear our thoughts on the upcoming season, keep reading. 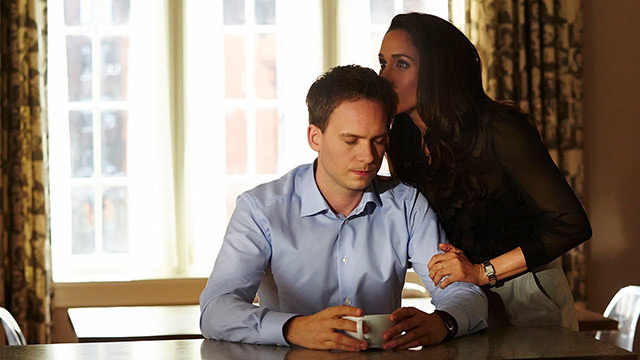 The season 7 finale saw Mike Ross (Patrick J. Adams) and Rachel Zane (Meghan Markle) get married and leave their jobs behind to set up their own clinic in Seattle. For two such important characters, the show gave them a pretty low-key send-off, which is likely in part to Markle marrying Prince Harry in real life. The chances of seeing Rachel ever again on Suits are pretty slim and while there’s no plans to bring Mike back in season 8, it’s possible he could return in the future. Aside from the abrupt goodbye for those characters, the season 7 finale set-up Jessica Pearson’s (Gina Torres) spin-off, due to debut in 2019, and saw Spector Litt go through yet another upheaval as they merged with Robert Zane (Wendell Pierce), Rachel’s father to prevent a takeover. I can’t help but feel like we’ve had this storyline a few too many times now but you’ll hear more about my thoughts on that shortly. 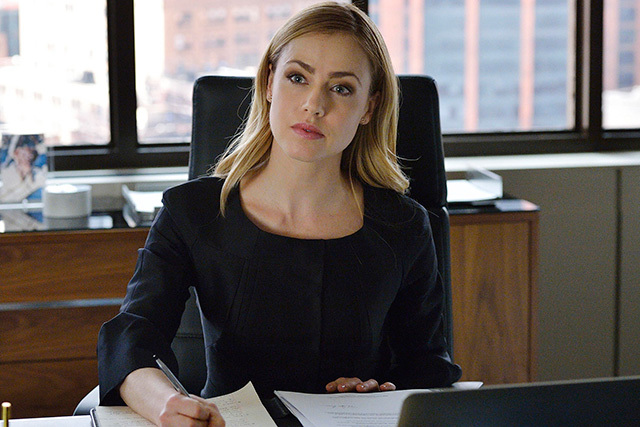 What we do know about season 8 is that Amanda Schull and Dule Hill have been upped to regulars as Katrina Bennett and Alex Williams respectively. Presumably Gina Torres will appear occasionally as she has since she left the series as a full-time cast member and Katherine Heigl (Grey’s Anatomy) has joined as new layer Samantha Wheeler. 1. An end to the endless changing nature of the firm. My memory could be failing but it feels like the first has merged, changed names and changed partners pretty much every season. It’s becoming a convenient go-to for the writers when they need to write themselves out of a hole and it’s getting repetitive. Please let this be the last time. 2. Katherine Heigl not to kill the show. 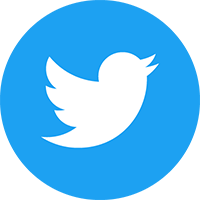 Before anyone starts angry tweeting at me, hear me out. I’m a fan of Heigl’s and have been since before her Grey’s Anatomy days. Having said that, there’s no getting away from her terrible reputation created by her speaking out against the projects that have made her the star she is – namely Grey’s Anatomy and comedy movie Knocked Up. She’s struggled to lead a show since with both State of Affairs and Doubt getting cancelled after only 1 season. I’ll reserve judgement but her casting has proved divisive and we’ve only seen one brief scene from season 8! 3. Mike and Rachel to continue being part of the narrative. Given that the whole premise of the show was Mike trying to hide his secret about not being a lawyer, it’s already going to be odd to watch the show without him. With Rachel’s father sticking around, I hope that both characters are still talked about and referenced so it still feels like they are around. It’s going to be a bit odd if they’re never mentioned again. 4. Darvey to finally be explored. 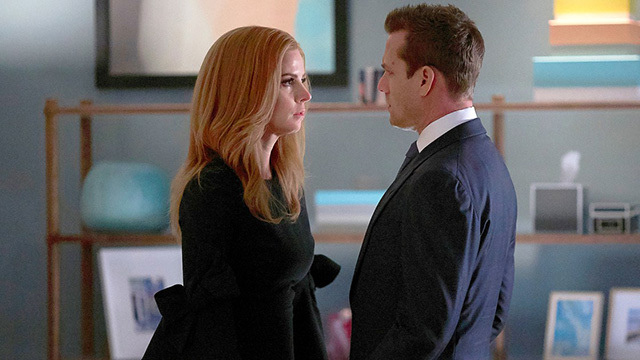 Donna (Sarah Rafferty) kissing Harvey (Gabriel Macht) caused all kinds of issues during season 7 but it also ended Harvey’s relationship with his former therapist Paula (Christina Cole). A brief return from Scottie (Abigail Spencer) couldn’t even tempt Harvey to move past his feelings for Donna and I seriously got the feels when Harvey and Donna danced at Mike and Rachel’s wedding. It’s time the show went there and explored if there’s a viable relationship for them to have. 5. Katrina to get plenty to do. I’ve been hoping she’d become a regular for a while now so I’m glad it’s finally happened. Katrina’s relationship with Louis (Rick Hoffman) is always fun to watch and she’s sufficiently different to Rachel so that it won’t feel like she’s trying to replace the gap she’s left. 6. Character development for Alex. Now he’s a series regular I really hope the character is fleshed out more than he has been. We still know very little about him and it would be nice to properly integrate him with the main cast. 7. Less focus on Louis and Sheila (Rachael Harris). Don’t get me wrong, I’m glad they’re together but please let that storyline rest for a season. Keep them together, bring Sheila in every now and again but no more silly games please. 8. Speaking of Louis, the constant flitting between good Louis and bad Louis has been done to death. He and Harvey need to get along as partners and it’s going to be a rough ride I’m sure as Robert Zane comes into the company. I hope Louis has Harvey’s back and we don’t repeat the same storyline again. 9. More juicy storylines for Donna. I loved seeing her really step up in season 7 and putting the awful memory of ‘The Donna’ far behind her. She proved last season that she earned the job she fought to get and she’s always the firm’s secret weapon. Let her continue to stand on her own and give her storylines that don’t rely solely on Harvey. 10. Gretchen (Aloma Wright) to have a bigger role. Who doesn’t love Gretchen? I felt like I hardly saw her in season 7. No one speaks to Louis in the plain way she does and I love her for it. She’s a great supporting character and I’d like to learn more about her. Suits returns to USA in the US and Netflix in the UK in July.